Sony has released a new promo video for the PlayStation VR, detailing the final spec list of its VR headset and giving us a proper look at the headset. 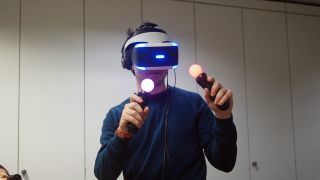 According to the video, the PlayStation VR will feature a 5.7-inch OLED display with a "1920xRGBx1080" resolution and a 120Hz refresh rate with under 18ms latency. It'll also have a field-of-view of approximately 100-degrees, an accelerometer and gyroscope, positional tracking with nine LEDs, 3D audio, as well as HDMI and USB interfaces. And despite VR headsets being a rather solitary experience, Sony is saying the PlayStation VR is actually social as "gameplay is output to both the VR headset and TV" allowing friends and family to see what you're seeing. If you're waiting to hear the price and a firm release date though, you're going to be left disappointed, as all we get is the company line we've heard before - it'll be launching in the first half of 2016. You can check out the video for yourself below.